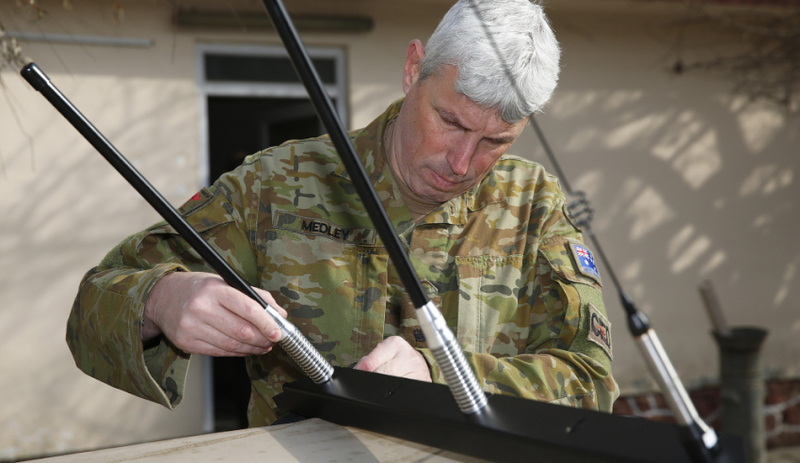 Australian Army officer Lieutenant Colonel Jason Medley prepares to install a Slivershield electronic force protection system, designed for the Afghan National Defence and Security Forces to counter radio-controlled improvised explosive devices. Image via Commonwealth of Australia, Department of Defence. L3 Micreo has delivered the first batch of the new SILVERSHIELD vehicle-mounted counter-improvised explosive device (IED) force protection systems to the Australian Department of Defence. The production order was awarded to L3 in March this year under the REDWING program, with the initial contract valued at $27 million for 13,000 units to be delivered in 2018. Sarah Earey, L3 Micreo vice president and general manager, said the counter-IEDs will help save lives. "We’re proud to be producing these life-saving force protection systems under contract to the Australian DoD," Earey said. "The REDWING counter-IED devices previously manufactured by L3 Micreo and currently deployed have proved to be vital in addressing the persistent threat in Afghanistan; this enhanced version of the vehicle-mounted system will continue to save lives." Under the REDWING program, L3 Micreo is contracted to support the Australian Defence Science and Technology Group’s development of the enhanced devices to provide an effective, easy to install and use, force protection system for mounting on light vehicles operating in hazardous environments. The systems require no hands-on tuning or maintenance and are designed ready for high volume production. A quantity of prototypes were produced by L3 Micreo and successfully field-tested at the end of last year. Announcing the award of the production order under the existing contract in March, Defence Minister Marise Payne said, “The REDWING program is a well-known example of successful collaboration with industry, and SILVERSHIELD is no exception. "IEDs continue to be the weapon of choice for insurgents in Afghanistan and due to their nature will likely remain a persistent and evolving threat to the ANDSF [Afghan National Defense and Security Forces]. For this reason, the REDWING program will continue to develop new product variants to meet this evolving threat." Minister for Defence Industry Christopher Pyne said the successful production of SILVERSHIELD shows Australia is able to meet and exceed manufacturing milestones. "SILVERSHIELD’s expedient production demonstrates Australian industry’s ability to meet and surpass the challenge of high volume and time critical manufacturing," he said.